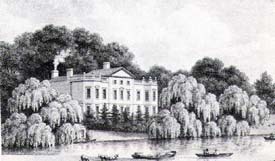 Alexander Pope is reputed to have planted a weeping willow in the riverside garden of his villa on the bank of the Thames. 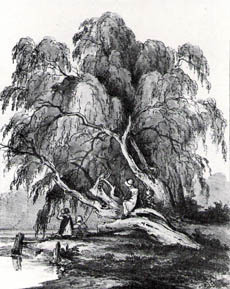 Weeping willows are thought to have been introduced to England by about 1700. There was certainly a willow here in his lifetime because, on 24 August 1742, he enclosed a bundle of twigs for Dr Pierce in Bath with a letter to Ralph Allen. Later in the century it appears to have acquired some fame and slips were being sent 'all over the world'. However, the source and botanical origin of his tree remains unclear. One story claims that Pope retrieved a live willow twig from a basket of figs sent from Turkey, Portugal or even Spain, to Henrietta Howard, planted it and so it flourished. This would have been during a visit to her new house, Marble Hill, which was nearing completion in 1728 and 1729. It is more likely perhaps that such a basket would have been made from withies from an osier (salix viminalis) rather than a weeping willow tree (salix Babylonica) at this time. Such a twig was unlikely to have survived the voyage alive, probably boiled before being woven into a basket and subsequently dry. The popularity of this story owes much to Thomas Pakenham's book 'Meetings with Remarkable Trees' first published in 1996. A more persuasive theory is that Pope obtained a sapling from Thomas Vernon, living at Twickenham Park. Vernon was his landlord and a Turkey Merchant, probably enjoying access to botanical specimens from that part of the world for cultivation on his estate. Writing in 1748, Peter Collinson (1694-1768) noted a specimen at Twickenham Park which he suggested Vernon had brought over in 1730; unlikely, because Vernon had died in 1726. During this period the willow was widely cultivated. In 1740 the landscape designer Charles Bridgeman was able to obtain 800 saplings to plant at Lodge Park in Gloucstershire. Salix Babylonica, as it was later classified by Linnaeus (Species Plantarum, 1753), appears to have been first noted near Bursa in Western Anatolia in 1676 by Sir George Wheeler. He may even have brought specimens home. Another candidate is the French botanist Joseph Pitton de Tournefort (1656-1708) who observed and recorded the species while travelling in the Levant in 1700-02. By 1730 London nurserymen were offering specimens in catalogues. Even the name Babylonica is the product of some misapprenhension. Linnaeus, may have been unaware of Eastern geography though probably familiar with psalm 137: "By the rivers of Babylon we sat down, ...(and) hanged our harps upon the willows in the midst thereof ...". However, the tree named gharab in early Hebrew versions is now known to have referred to the poplar, and the rivers were, of course, the Tigris and Euphrates. In any case, the species appears to have come from as far east as northern China. No picture of the villa in Pope's lifetime shows a willow tree. The earliest known engraving, of 1735, shows planting in detail but no weeping willow: nothing masks the villa. In fact, no view shows a willow tree until about 1755, in an unsigned watercolour in the collection of the London Borough of Richmond upon Thames at Orleans House Gallery. This picture shows a single tree of no great height masking the left of the villa before its extension by Sir William Stanhope. 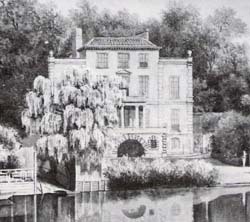 In fact, it is not until views of 1780 and 1782 that weeping willows, now majestically mature, are to be seen, flanking the enlarged villa. The original twig, now legendary, had spawned clones and by this time Pope's willow had acquired near-divine iconic identity, its inclusion obligatory in any drawing. However, age was taking its toll: A writer in The Topographer in 1789 noted that “towards the margin of the stream, propped with uncommon care, and guarded by a holy zeal from the ravages of time, still stands the Weeping Willow, planted by the hand of 'The Bard of Twickenham'. From this a thousand slips are annually transmitted to the most distant quarters of the globe, and during the present year the Empress of Russia has planted some in her own garden at St Petersburg”. It is possible that the fame of this tree rested on its promotion by Welbore Ellis who, as son-in-law of Sir William Stanhope, had inherited and extended the estate and was basking in some wished-for lustre as guardian of Pope's memory. S. Babylonica was not really hardy in a northern winter climate and most had died out in England by the end of the 19th century, supplanted by other hybrids such as S. Sepulchralis and, later, S. Chrysocoma, the golden weeping willow. If, as reported, Catherine the Great was sent twigs from Pope's willow they would surely not have survived many St Petersburg winters. Twigs found their way to America. William Waring, the English son of an apothecary went over in about 1830, apparently taking with him a cutting from Pope's willow which he caused to be planted on the Mall near Old Main in Penn State University, its site now only marked by a plaque. This date must be questioned: the tree had been dead and gone for 20 years; a cutting would have been a substantial sapling by 1830. Turner had already bought some land in Twickenham where, by 1812, he had built his own villa, Sandycombe Lodge. There was a pond in the grounds, presently enlarged and surrounded by willows perhaps grown from the “fostered scion nursed to life” in the poem. At Pope's Villa the original tree, dead, was taken down and a section of the trunk carried into the grotto. 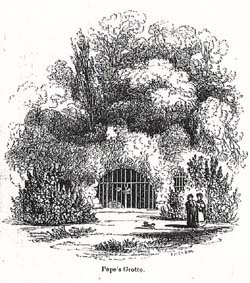 This was noted in The Gentleman's Magazine in July 1842 (page 45): “the dry and touchwood stump is placed in the grotto” and later in The Journal of Horticulture and Cottage Gardener on 11 August 1887 (page118) where it was stated of “the poet's Weeping Willow” that “an old trunk is still preserved in the grotto”. The trunk was included in a view of the grotto entrance, behind the gates, made in 1845 and it is to be seen today, resting in a corner of the grotto, a remarkable survival.